To investigate the corneal biomechanical responses of subclinical keratoconus with normal topographic, topometric, and tomographic findings. In this prospective observational study, the study group was selected from patients with clinically evident keratoconus in one eye and subclinical keratoconus with normal topographic, topometric, and tomographic findings in the fellow eye. The control group was selected from candidates for contact lens use. The biomechanical analyses were performed using the Corvis ST (Oculus Optikgeräte, Wetzlar, Germany). The following parameters were analyzed: A1 velocity, A2 velocity, A1 length, A2 length, deformation amplitude ratio, stiffness parameter at the first applanation, Corvis Biomechanical Index, and Tomographic and Biomechanical Index (TBI). The study group consisted of 21 patients (10 men and 11 women; mean age: 27.7 ± 6.9 years), and the control group consisted of 35 patients (17 men and 18 women; mean age: 26.1 ± 5.8 years). 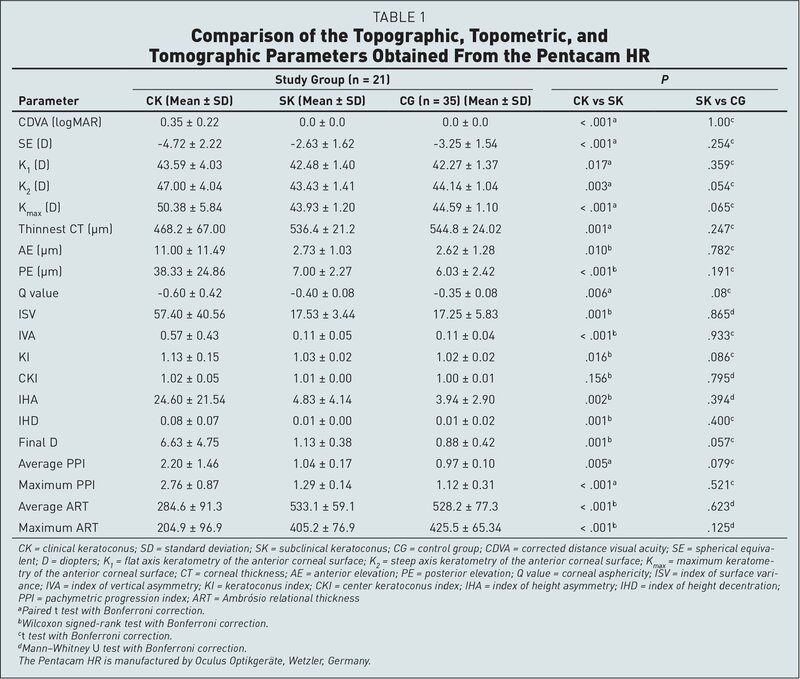 No significant differences were found between the eyes with subclinical keratoconus and normal eyes in corrected distance visual acuity and the topographic, topometric, and tomographic parameters (P > .05). Significant differences were found in the values of A2 length, A1 velocity, A2 velocity, and TBI between the subclinical keratoconus group and the control group (P < .05). In distinguishing eyes with subclinical keratoconus from normal eyes, the TBI showed the highest area under the curve (0.790; cut-off: 0.29; sensitivity: 67%; specificity: 86%) in the receiver operating characteristic analysis. Biomechanical analysis with the Corvis ST may be used as a complementary diagnostic method in detecting subclinical keratoconus. This study investigated the corneal biomechanical properties of patients with subclinical keratoconus who have no topographic, topometric, and tomographic findings. This prospective observational study was conducted in accordance with the tenets of the Declaration of Helsinki and with the approval of the Ankara Numune Education and Research Hospital Ethical Committee. In our previous study in which we examined the medical records of 3,474 patients with keratoconus, we determined 38 patients had clinical keratoconus in one eye and no suspicious or abnormal topographic, topometric, and tomographic findings in the fellow eye.9 These patients were recalled to our cornea clinic, and a complete ophthalmologic examination including Pentacam HR (Oculus Optikgeräte) measurements was performed. The control group was randomly selected from a database of age-matched candidates for contact lens use for myopia (≤ 5.00 D) and myopic astigmatism (≤ 3.00 D) that had normal topographic, topometric, and tomographic analyses. The control group was selected from the contact lens users to form groups with similar ages and refractive errors. One eye of each control patient was randomly chosen. Patients with a history of anterior segment surgery, ocular surface problems, and topical eye drop use were excluded. The measurements were performed after rigid gas-permeable contact lenses had been stopped for at least 3 weeks and soft contact lenses had been stopped for at least 1 week. The study data were analyzed using the Statistical Package for Social Sciences (SPSS) software (version 22.0 for Windows; SPSS, Inc., Chicago, IL). The chi-square test was used to analyze the categorical variables. The normal distribution of the variables was tested by visual (histogram and probability graph) and analytical (Kolmogorov–Smirnov and Shapiro–Wilk tests) methods. When a parametric analysis was possible, the three groups were compared using a paired t test for the paired data or Student's t test for the un-paired data along with the Bonferroni correction. When a parametric analysis was not possible, the groups were compared using the Wilcoxon signed-rank test for the paired data and the Mann–Whitney U tests for the un-paired data. A P value of less than .05 was considered statistically significant. The receiver operating characteristic (ROC) curve was used to obtain cut-off values to differentiate the eyes with subclinical keratoconus from the normal eyes. The biomechanical parameters that showed statistically significant differences between the eyes with subclinical keratoconus and the normal eyes were included in the ROC analyses. Twenty-six of the 38 patients who were recalled came to our clinic. Five of the 26 patients were excluded from the study because of suspicious or abnormal findings in the recent Pentacam measurements. The study group was formed from the remaining 21 patients (10 men and 11 women) with a mean age of 27.7 ± 6.9 years (range: 16 to 38 years). The control group consisted of 35 patients (17 men and 18 women) with a mean age of 26.1 ± 5.8 years (range: 16 to 36 years). No statistically significant differences were found in age and gender between the study and control groups (P = .671 and .746, respectively). Table 1 shows the corrected distance visual acuities (CDVA), spherical equivalents (SE), and topographic, topometric, and tomographic parameters of the groups. The CDVA was significantly lower and the SE significantly higher in the clinical keratoconus group than those in the subclinical keratoconus and control groups. No statistically significant difference was found in either the CDVA or the SE between the subclinical keratoconus and control groups. Statistically significant differences were observed in all measured parameters except center keratoconus index between the clinical keratoconus group and the other two groups. No significant difference was found between the subclinical keratoconus and control groups. Table 2 shows the results of the biomechanical analysis of the groups. Significant differences were found in all measured parameters between the clinical keratoconus and control groups. Statistically significant differences were detected in A2L, DA ratio, CBI, and TBI values between the clinical keratoconus and subclinical keratoconus groups. Statistically significant differences were also found in the A2L, A1V, A2V, and TBI values between the subclinical keratoconus and control groups. Table 3 shows the results of the ROC curve analysis for these parameters for the eyes with subclinical keratoconus versus the control eyes. In distinguishing eyes with subclinical keratoconus from normal eyes, the TBI showed the highest area under the curve (AUC) value, sensitivity, and specificity. Tomographic and topographic changes in keratoconus are considered to develop because of biomechanical instability.3–5 According to this hypothesis, the focal biomechanical alteration causes thinning and bulging with time, and forces such as intraocular pressure and itching also contribute. This hypothesis claims that the determination of early biomechanical changes can detect keratoconus earlier than topographic and tomographic analyses.5,14 Patients with subclinical keratoconus without topographic and tomographic findings are the most appropriate population for which this claim can be assessed. The reason is that, according to global consensus, keratoconus is bilateral and subclinical keratoconus is present even if there are no topographic and tomographic findings in the fellow eye.1 Thus, in the current study, the biomechanical properties of the cornea were evaluated in patients who had clinical keratoconus in one eye and no keratoconus findings in the fellow eye. Previous studies using the Corvis ST showed that corneas with moderate and advanced stages of keratoconus are biomechanically weak.8,11,15 However, diagnosing keratoconus with other methods is not difficult in these patients. The main problem is detecting subclinical keratoconus. Steinberg et al.12 reported one of the first studies in which patients with subclinical keratoconus were evaluated with the Corvis ST. In the current study, the first set parameters of the Corvis ST (A1V, A2V, A1L, and A2L) were used, and the values of the subclinical keratoconus and control groups were found to be similar. Although the A1L and A2L values were significantly different between the clinical keratoconus and control groups, the sensitivity and specificity were low.12 In another study, this first set parameters (DA, A1 time, A1L, A2 time, and A2V) was significantly different from the control group in patients with subclinical keratoconus with normal topography.16 However, we considered the topographic diagnostic criteria of this study to be questionable because the topography of the patients presenting with subclinical keratoconus was compatible with clinical keratoconus. Moreover, Francis et al.13 stated that the diagnostic capacity of some first set parameters could be increased by waveform analysis. In our study, we also found that A2L, A1V, and A2V were significantly different from the control group in the subclinical keratoconus group. However, we consider these parameters to be clinically not feasible because of low sensitivity and specificity. Ambrósio et al.11 found that using the TBI after the CBI enhances the ability of the Corvis ST to diagnose keratoconus. The TBI is a parameter produced by combining the Scheimpflug-based corneal tomographic data and the biomechanical data with a logistic regression analysis. According to this study, when the cut-off value was 0.79, the TBI distinguished patients with clinical keratoconus from those with normal eyes with 100% sensitivity and specificity (AUC = 0.996). When the cut-off value was 0.29, it was shown to have 90% sensitivity and 96% specificity in patients with VAE (AUC = 0.985).11 In our study, the cut-off value was 0.29, similar to this study. However, the TBI had a sensitivity of 67% and specificity of 86% with an AUC value of 0.790 in distinguishing eyes with subclinical keratoconus from normal eyes. The difference between our results and those of the mentioned study is probably due to the difference in patient selection as stated above. In Ambrósio et al. 's study, 42.6% of the patients had a final D value higher than 1.60 D, indicating a problem in their tomographic analysis. Because tomographic analysis is also considered in the calculation of TBI, the diagnostic capacity can be expected to be higher than that of our study. No abnormality was found in the tomographic analysis of any patient in our study. The main limitation of our study is the low number of patients. We strictly maintained the inclusion criteria to perform the biomechanical analysis closest to ideal. Another limitation is that we did not consider intraocular pressure in the groups. Intraocular pressure may affect the biomechanical behavior of the cornea.21,22 Moreover, keratoconus is considered a bilateral disease based on a global consensus on keratoconus and ectatic diseases in our study.1 However, it should be noted that even if the probability is low, true unilateral keratoconus may be present in our patients. Looking at the developments in the diagnosis of keratoconus, we believe that the early diagnosis of keratoconus in the future will be conducted through in vivo methods that evaluate “causalities” such as the local biomechanical alteration of the cornea and the deterioration of the collagen structure, not the methods that evaluate “outcomes” such as changes in the corneal surface and thickness. Biomechanical analysis with the Corvis ST may be one of the complementary diagnostic evaluations in detecting patients with keratoconus without any topographic and tomographic abnormalities, but it is not sufficiently sensitive to be used alone. Further prospective studies involving a larger number of patients with subclinical keratoconus with normal topographic and tomographic values are needed to determine the usefulness of Corvis ST measurements in detecting early keratoconus. From Ulucanlar Eye Training and Research Hospital, Ophthalmology Department, Ankara, Turkey (MK, EA, PK, HK); and Ercis State Hospital, Ophthalmology Department, Van, Turkey (KT, MI).